I actually had a stamp set in my stash that included a pair of wings, SU's "Fashion Statements" so that was my first idea for this challenge, F4A378 at Splitcoaststampers. I stamped the wings with Versamark and embossed them with gold EP, then washed over them with sparkly LuminAire watercolors. For the front I embossed the leaf design with white EP, then smooshed Gina K inks in Island Dream over the top. I embossed the sentiment with clear EP over Brutus Monroe onyx ink and dressed up a couple of the letters with a gold calligraphy pen. Hi Kathy, thanks for visiting my blog and leaving me a comment. 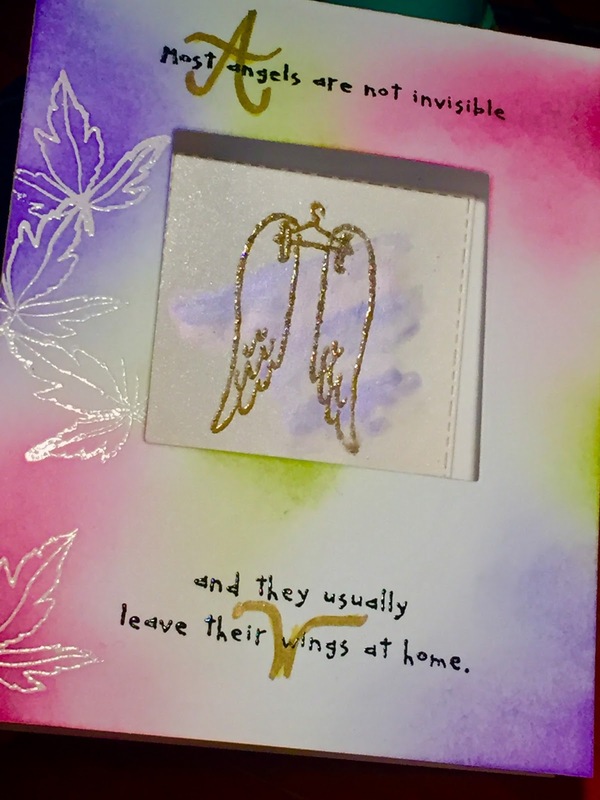 I love your angel wings card, I have never seen that set before. Beautiful!